Fortified by their faith, the fire-walkers step out onto the glowing path while the audience cries out encouragement. 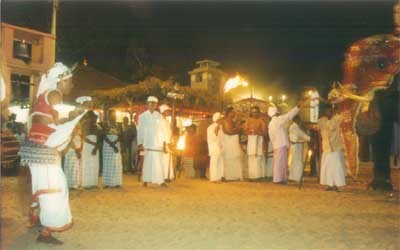 Kataragama hums with activity at the time of pujas (offerings or prayers). Devotees laden with offerings move lightly, barefoot, up the temple steps. From inside comes the sharp sound of breaking coconuts as worshippers begin their devotions. It's just after six in the evening, not long now to the evening puja. A queue snakes round the shrine's inner walls; the people stand patiently, clutching plates heaped with fruit and flowers and decorated with brilliant red garlands made only for Skanda, son of Shiva and the god of war and wisdom, for whom the main shrine in Kataragama is dedicated. It is said that Skanda rested on the mountain at Kataragama after defeating an army of demons. A murmur ripples through the crowd. The temple elephant is making its ponderous way through the north gate and across the courtyard to the first of three shrines. Aloft in its trunk it holds a sin­gle lotus flower. The mahout taps the elephant gently on the shoulder and it kneels, placing the lotus before a statue of the Buddha. The elephant heaves itself off its knees and turns towards the next shrine, dedicated to Ganesh. The performance is repeated and the elephant is rewarded with a few bananas. It moves towards the final shrine, the Maha Devale. The crowd parts silently and the elephant glides gracefully through, unperturbed. It kneels. A sigh rises from the crowd. The shrine doors are about to be flung open to admit the worshippers and their gifts. This gentle rhythm is broken only for the annual festival that is held on the Esala poya (full moon), usually in late July or early August. This is a time of feverish activity at Kataragama. Elephants parade, drummers drum. Vows are made and favours sought by devotees who demonstrate their sin­cerity by performing extraordinary acts of penance and self-mortification: some swing from hooks that pierce their skin, others roll half naked over the hot sands near the temple. A few perform the act of walking on beds of red-hot cinders—treading the flowers, as it is called. 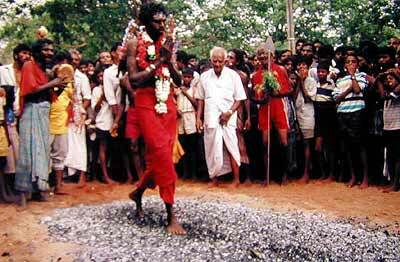 The fire-walkers fast, meditate and pray, bathe in the Menik Ganga and then worship at the Maha Devale before facing their ordeal. Then, fortified by their faith, the fire-walkers step out onto the glowing path while the audience cries out encouragement. The next morning the festival officially ends with a water-cutting ceremony (said to evoke rain for the harvests) in the Menik Ganga.  The Kataragama shrine is ancient. Legend has it that it was built by King Dutugemunu in the 2nd century BC, but it is apparently even older than this. There is an old pilgrimage route to Kataragama that starts in Jaffna and runs down the east coast, passing through Yala. Because of the war, this route is sadly too risky to undertake. But pilgrims still make the trek up the mountain. At dusk you can see the lights from the shrine on the mountain from the precincts of the Kataragama shrine.